Chrome warning about malware on magicjacksupport.com site? Is there a novice thread? Google chrome on a thin client? Anybody get it to work? Pay as you go phone? Hello there, just meandered in. 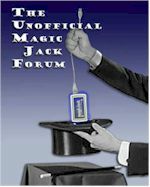 Who has the oldest Magicjack???? ?